The 6 x 4 Overlap Pressure Treated Wooden Shed With Lean-To is a very smart looking shed. The lean to really does give it a different look to what most other sheds offer. 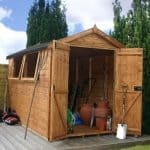 The actual shed is ideal for gardens that do not have a lot of space, but with the lean to, you are giving yourself that little bit of extra storage room. The shed has a good sized single door that has double z framing to make it extra strong. One side of the shed has a cleverly placed fixed window which will allow plenty of light inside. 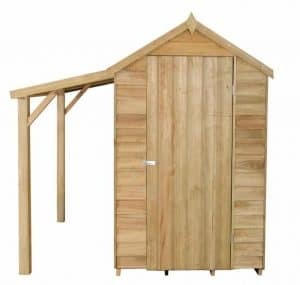 This is a very affordable shed so it is quite surprising just how high quality it is. To start with they have used some very smart looking overlap cladding. This is supported with a very well made frame to ensure the shed is one very strong structure. The lean to is just as well made. It is supported with the same kind of roof as the actual shed and it has a frame that is made from some very thick pieces of timber. Under your feet in the shed is a very strong floor so if you do have heavy items them will be fine in here. 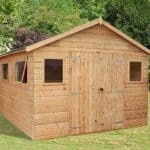 With its awesome little lean to, the 6 x 4 Overlap Pressure Treated Wooden Shed With Lean-To is certainly a very eye catching shed. 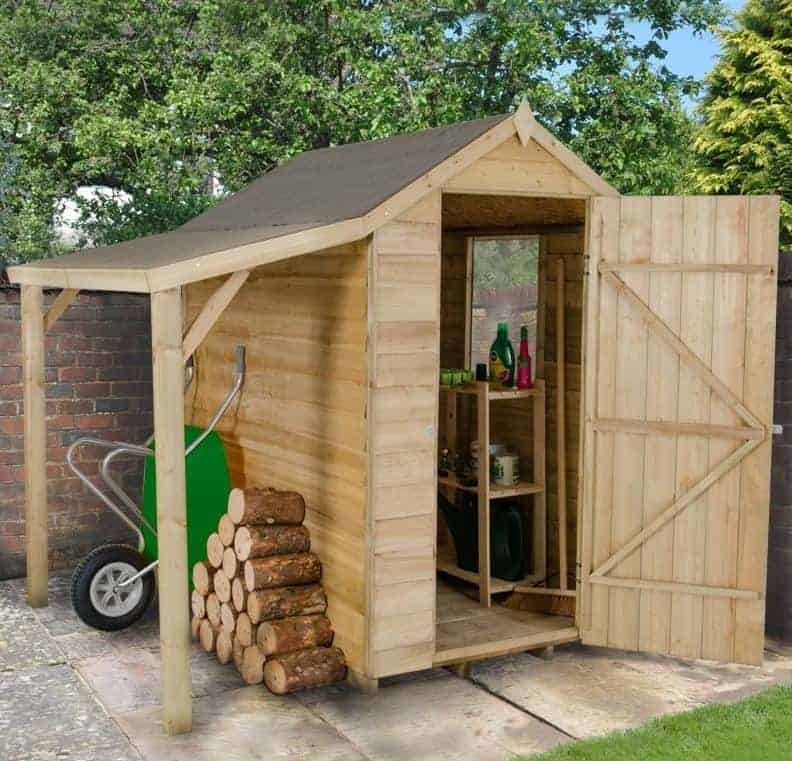 This is actually what we would class as a compact sized shed as the actual shed offers 5 feet 9 inches of depth and just a hair under 4 feet of width. But of course with that lean to you do have a space where you can keep a few things that you do not mind being a little exposed to the elements. Things like wood, a wheelbarrow or even some inexpensive gardening equipment like a shovel or hoe. At the very least, if you have kids it may stop them just dumping their bikes on the lawn! They can dump them at the side of the shed instead. The ridge is very high at 6 feet 8 inches so walking all the way to the back of the shed will be fine. The eaves are 5 feet 4 inches high and this is right around what we would expect in a shed of this size. The roof is made with solid sheet boarding which at this price range is fine. It is strong enough to handle a lot of snow and also your neighbour’s cat that likes to run along it. As this has a lean to, the apex roof has a very cool and rather unique look as on one side it slopes even further. We really like this and think that it gives the shed a lot of personality. Both the lean to and the actual apex roof are covered with some nice looking roofing felt. 8 mm thick overlap cladding is what the 6 x 4 Overlap Pressure Treated Wooden Shed With Lean-To has to offer and we really like it. This is good cladding for keeping out the rain and it also has a very smart, rustic look to it as well. Some might think that 8 mm thick is a little thin, but at this price we feel that it is okay and that it will still be strong. Connected to that smart looking cladding is a 28 mm x 28 mm frame. This is exactly the kind of frame we would expect to see in a 6 X 4 shed. This frame is very well designed and you will find that it ensures the shed has a very robust feel to it. The frame is also going to be the main reason that this shed is still standing strong years from the day you install it. The lean to is supported with some strong and thick timber which means it is able to take any abuse from you when you knock into it by mistake or from one of the kids when they run into it when pretending to be Superman. The fully boarded floor was a very nice surprise. We expected there to be a solid sheet boarding floor, so seeing this thick and strong floor was great. This means that even heavier items will be fine inside of here. The floor is going to last many years and not feel weak and flimsy as you are walking on it. 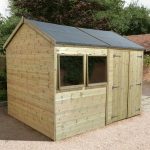 At under £300 we are very surprised to see that the 6 x 4 Overlap Pressure Treated Wooden Shed With Lean-To is pressure treated. Actually pressure treated is in the name so we should not have been that surprised. But you get our point. Having wood that has been pressure treated at this price point is quite rare. This means that the wood from the moment it arrives at your house is set up for the rest of its life. You have no need to treat it after installation or on an annual basis their after. With this shed you get a very generous 15 year anti rot guarantee. As the wood is pressure treated, we do not see you having any issues with rot, but it is good that it is there. There is a single door on the front of the shed and it is very well designed. To start with it has hidden door hinges so it has a very uniform look with the rest of the shed. It is also extra strong as it has double z bracing which prevents the door from becoming weak as the years go by. 5 feet 4 inches is the height of the door and 2 feet 2 inches is the width. 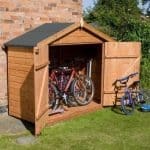 This is more than enough room to get things in and out of the shed – things like a mower or even an adult-sized bike will be able to go in and out with ease. There is a polycarbonate fixed window on one side of the 6 x 4 Overlap Pressure Treated Wooden Shed With Lean-To. This is going allow plenty of natural light into the shed and as it is polycarbonate it is safe from smashing into a million little pieces. The hidden door hinges do help a bit with security and it does come with a hasp and staple, but there is no included lock. So if you do want to keep things locked away from potential thieves, then you will want to get some kind of padlock. While there is a window, we do not think lack of privacy is an issue this shed has. The window is kind of out of the way and unless you had the shed facing the street this way, people would never know there was a little window. If you do want some privacy then adding some blinds would be relatively cheap and easy to do. As is the case with most other pressure treated sheds there are not any customisation options available here. We know some of you may want to rush out and buy a tin of paint to give it a little colour. If you do this, make sure the paint is ok to go onto wood as the last thing you want to do is ruin that lovely looking cladding. 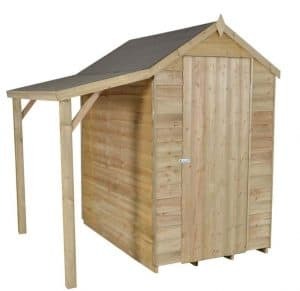 The 6 x 4 Overlap Pressure Treated Wooden Shed With Lean-To does have a couple of pretty interesting extras on offer. They have a Yale Shed Security Kit, which costs £25.99. This is a great security set, but you could always just add your own padlock to the hasp and staple that is already on the shed. They also have a set of Shed Hooks. For £7.99, you get four hooks which come in handy for things like rakes, shovels and hoes. Last of all they have an installation service, which is priced at £109.99. This is not the most expensive installation service we have seen, but if you are moderately skilled at DIY, we feel you will be fine installing this yourself and save some money in the process. 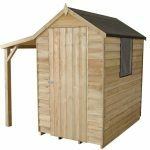 At this price, the quality of this shed is fantastic. Overlap cladding, fully boarded floor, pressure treated and of course that lean to. They really have done a great job with the design of this shed. As the wood is pressure treated this is going to last you a very long time. You do not even have to do much in the way of maintenance to ensure this. 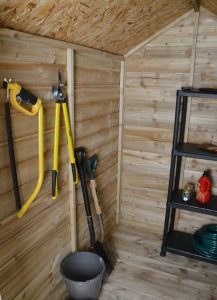 We must say that this is a compact sized shed so you do not have a ton of space in the shed, but the lean to will come in very handy and does give you a bit extra storage space. This is not the largest shed in the world so as long as the person helping you knows the difference from a hammer and a screwdriver you should be fine. 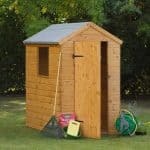 At under £250 this shed is fantastic value for money. It is so good that we can see this selling out pretty fast. 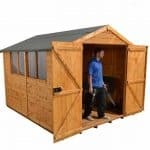 Final Thoughts: The 6 x 4 Overlap Pressure Treated Wooden Shed With Lean-To is a shed that we really like. Many people at the WhatShed office commented on how smart the lean to looked. 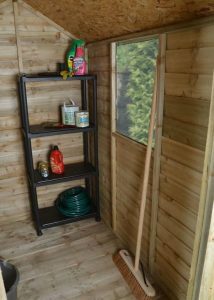 Even though this is a smaller shed, we feel that the little extra space you get with the lean to does help. The fact this is pressure treated makes it great for those who do not want to treat or know they will forget to treat the shed once a year. The impressive cladding, floor and door are all high quality. Much higher quality than the price tag suggests. If the storage space that this shed offers is just what you need, then we feel this would be an ideal shed for you.